Veritas | Headed to the multi-cloud? You don’t need a travel agent, you need a guide. Every phase of the cloud is different, but the common thread that runs through it all is Veritas. That’s because we focus on your information. Not where it’s stored. According to a recent IDC report, 85% of enterprise IT organizations will commit to multi-cloud architectures by 2018(1). We believe data and workload management are critical components of a successful multi-cloud strategy through all of its phases—from migrating, to optimizing to conquering. Establishing visibility into your information across clouds. Enabling portability of information and workloads across clouds. Holistically addressing regulatory and compliance issues. To learn more, please complete and submit the form to access the brief. 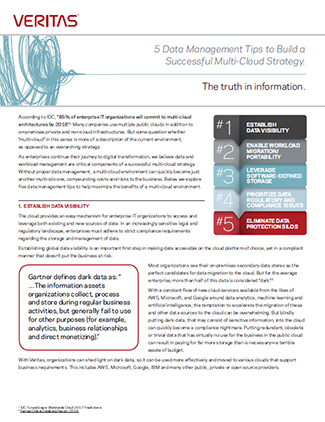 Thank you for your interest in "5 Data Management Tips to Build a Successful Multi-Cloud Strategy"
Please click here to download the brief.